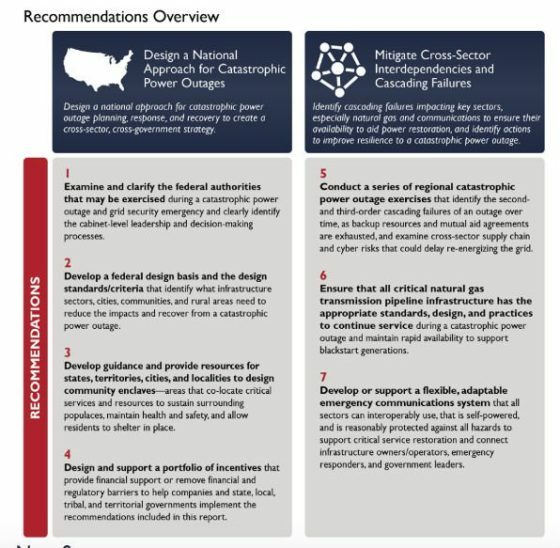 After interviews with dozens of senior leaders and experts and an extensive review of studies and statutes, we found that existing national plans, response resources, and coordination strategies would be outmatched by a catastrophic power outage. This profound risk requires a new national focus. The NIAC was challenged to think beyond even our most severe power disruptions, imagining an outage that stretches beyond days and weeks to months or years, and affects large swaths of the country. Unlike severe weather disasters, a catastrophic power outage may occur with little or no notice and result from myriad types of scenarios: for example, a sophisticated cyber-physical attack resulting in severe physical infrastructure damage; attacks timed to follow and exacerbate a major natural disaster; a large-scale wildfire, earthquake, or geomagnetic event; or a series of attacks or events over a short period of time that compound to create significant physical damage to our nation’s infrastructure. An event of this severity may also be an act of war, requiring a simultaneous military response that further draws upon limited resources. For the purpose of this study, the NIAC focused not on the cause, but rather on the consequences, which are best categorized as severe, widespread, and long-lasting. People no longer keep enough essentials within their homes, reducing their ability to sustain themselves during an extended, prolonged outage. We need to improve individual preparedness. Most preparedness campaigns call for citizens to be prepared for 72 hours in an emergency, but the new emerging standard is 14 days. For example, Washington, Oregon, and Hawaii have a standard that individuals have enough food and water to support themselves for 14 days. These efforts could serve as a model for federal and state preparedness resources, campaigns, and training. The idea of individual preparedness is not a new concept. Civil defense, an older term used to elevate a level of individual preparedness and activate communities, used to be be more widely accepted. FEMA offers a number of tools, resources, and guidance on emergency preparedness, including recent efforts focused on better financial preparedness for disasters, and working with interagency partners on activity books and courses to educate students on emergency preparedness. 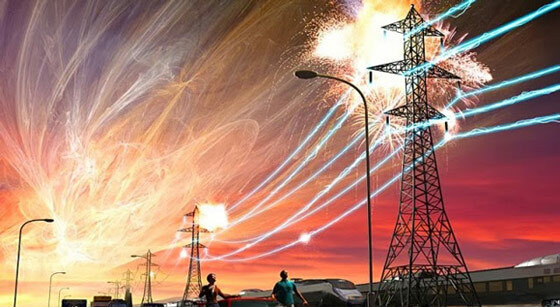 The EDTF report examined threats from across the electromagnetic spectrum, including nuclear and non-nuclear EMP, geomagnetic disturbance (GMD), lasers and optics, directed energy (DE), and high-power microwaves (HPM), along with management of these threats. Both reports should provide an incentive to prepare for a grid-down event, if you haven’t adequately prepped already. There are a few (totally insane) things you can expect during a grid failure. We have been aware of EMPs and SMEs for a long time. The latter, solar mass ejections, are inevitable but unpredictable. I am hoping (dreaming?) that the problem has been solved, and that the trillions of our missing dollars has been put to good use.